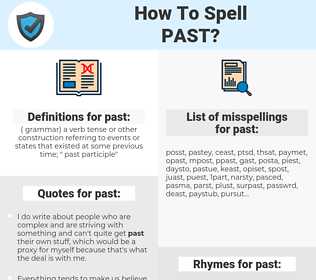 What are the misspellings for past? What are the common mistypes for past? What is the definition of past? What does the abbreviation past mean? What are the quotes for past? What are the rhymes for past? What are the translations for past? 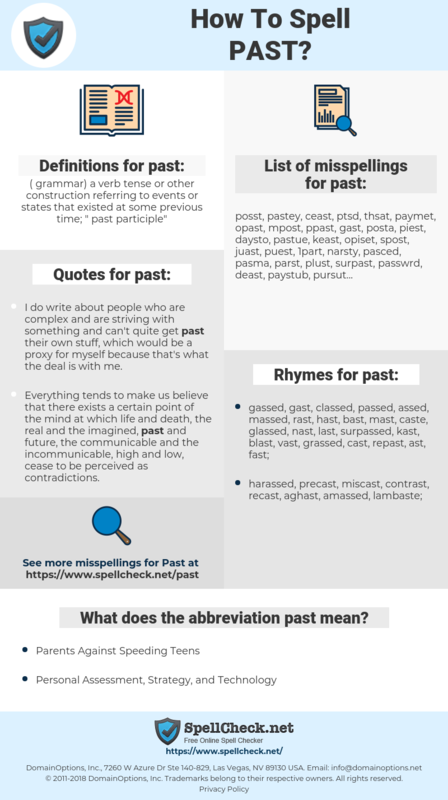 What are the common typos for past? (grammar) a verb tense or other construction referring to events or states that existed at some previous time; "past participle"
This graph shows how "past" have occurred between 1800 and 2008 in a corpus of English books. I do write about people who are complex and are striving with something and can't quite get past their own stuff, which would be a proxy for myself because that's what the deal is with me. What was any art but a mould in which to imprison for a moment the shining elusive element which is life itself- life hurrying past us and running away, too strong to stop, too sweet to lose. Look at the United States today. We have made mistakes in the past. We have had shortcomings. We shall make mistakes in the future and fall short of our own best hopes. over, voorbij, afgelopen, verleden, eerder, vroeger, voormalig, verleden tijd. nach, Geschichte, letzte, bisherig, ehemalig, Dossier, Vorgeschichte, einstig, vorig, längs, Vergangenheit, vergangen, vorbei, Vorleben, beendet, anterior. antigo, passado, passada, história, ultrapassado, antigas, transacto, antiga, antigos, pretéritos, transcorrido, pregressa, decorrido, pretérito. прошедший, прошлое, минувший, мимо, прошедшее, былое, прошедшее время. antecedentes, antiguo, pasado, historial, historia, por delante de, transcurrido.